Unión del Barrio has historically been among the few raza organizations that has actively attempted to stay ahead of ever-changing local, national, and world conditions as they relate to our communities within the current borders of the United States. Though our organization has evolved over time, we remain committed to the fundamental objective of winning the complete liberation of all raza, from Chile to Alaska, as well as supporting the struggles for self-determination of all the world’s oppressed peoples and nations. We are La Raza, the people of these lands, and we challenge any and all manifestations of colonial, imperialist, and neoliberal oppression. Our use of the term La Raza is understood as meaning “the people”, and it encompasses the entire population of “Nuestra América”. It is a progressive term that unites our cultural, ethnic, gender, and racial diversity with the liberatory aspirations of indigenous and Latin American nations. Used together, La Raza de Nuestra América represents our transcontinental unity as a people, sharing a similar political conditions, cultures, histories, and class interests. The struggle of Unión del Barrio is one part of an indigenous resistance across North and South America, from Alaska to Tierra del Fuego, with politically imposed borders that primarily serve the interests of an international capitalist elite that is currently led by United States imperialism. 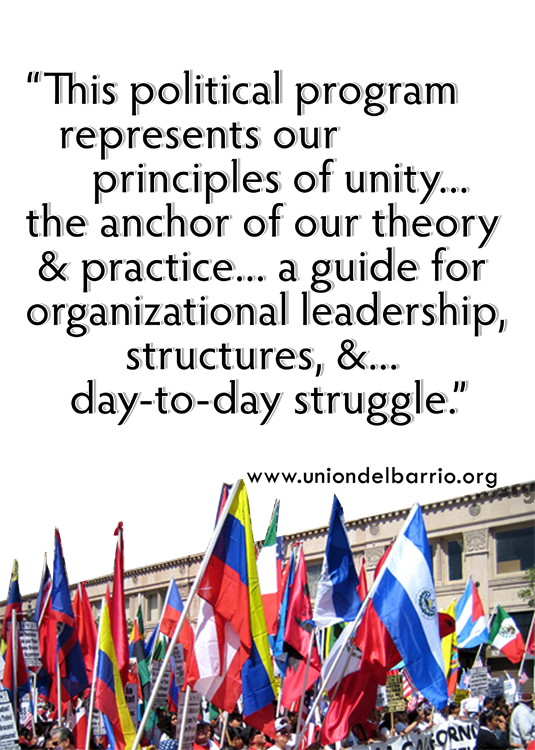 Unión del Barrio is a revolutionary organization of disciplined and honest individuals committed to advancing the science, strategy, and organizational structure necessary to overturn our oppression and advance the liberation of México and Nuestra América. What remains is our long-range task of building a party capable of winning recognition from the majority of La Raza, who accept our efforts as representative of a path to a better future. We work tirelessly to unify the collective power of raza workers, barrio youth, educators, indigenous communities, LGBTQ+ people, mujeres, prisoners, and students into a single sustainable socio-political movement for self-determination and liberation. One of the principal shortcomings of our movement during the “Chicano Power” period (1965 to 1975) was the lack of a coherent ideology. This political weakness made organizations and individual activists susceptible to self-serving interpretations of our struggle. Debates framed the movement as one for “civil rights”, as an auxiliary to white workers, or based primarily on developing an identity within the political culture of the United States. Deeper questions and challenges to the movement went unanswered by the political programs of the time, and this ideological weakness hindered the development of advanced political organizations, contributing to the burn-out, drop-out, or sell-out of innumerable otherwise excellent militants. Furthermore, this ideological weakness made our movement more susceptible to state sponsored defamation, infiltration, and repression. We live in a time where change is constant, crisis is permanent, and nothing is static. Opportunists argue that the most pressing struggle is to accommodate and assimilate to political change as defined to us by United States imperialism. For Unión del Barrio, surviving and growing within “the belly of the beast” has not been a simple matter of adapting our principles to current conditions, but holding fast to our Political Program which links us to the enduring principles and methods of revolutionary struggle accumulated over generations. While exploitation, neocolonialism, and imperialist aggression continue to exist, our priority is to expand our work, sharpen our ideology, and further consolidate Unión del Barrio as a revolutionary organization. This is what we have done since our formation in 1981, and what we will continue to do as part of the liberation struggle in México and Nuestra América. We continue to carry the torch of organized liberation struggle, and this is one of the most important contributions we can make to the worldwide struggle to end the subjugation and repression of the vast majority of people on the planet earth. Since our founding in 1981, Unión del Barrio has prioritized the development of a Political Program that best represents the revolutionary interests of our movement. For this reason, we have expanded, refined, and enriched our political program, bringing us closer to building a revolutionary party necessary to assume a leading role as part of the liberation struggle of México and Nuestra América. One of Unión del Barrio’s principle contributions to the legacy of the Chicano Movement has been the development of a Political Program that not only articulates a revolutionary agenda, but also speaks to the immediate needs of our communities, supported by our daily work among our peoples. With this political program we address the realities of La Raza, and provide a vision for the urgent defense of our rights and interests within the present boundaries of the United States. Finally, this Political Program embraces and advances our connection to the rest of Nuestra América, as well as defines our relationship to all oppressed and colonized peoples on this planet. Effective collective action can only be achieved through the articulation of a cohesive ideology, and as such requires a political program capable of guiding our daily organizational efforts as the building blocks of a revolutionary movement for freedom and self-determination. 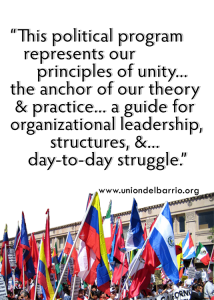 This Political Program represents our principles of unity – it anchors our theory and practice to serve as a reference for our militantes who lead day-to-day struggles, and as a guide for organizational practices and structure.